It has been a busy summer of drawing out on location and the exceptional weather this year has made it a real pleasure to be out at the crack of dawn or late into the evening. I was fortunate enough to receive a bursary from the Society of Wildlife Artists to attend the John Busby Seabird Drawing Course in East lothian in June. And it was an unforgettable week of new friendships, inspiration, the highs and lows of wrestling with subject matter and drawing conditions from glaring sunshine to drawing-snatching winds and the queasy motion of a small boat. We experienced the grandeur of impregnable sea stacks, rocky islands and pinnacled cliffs, swirling masses of birdlife overhead to sitting in the very midst of a gannet colony surrounded by sharply poised beaks and watchful eyes. It was a glimpse of life at its most vital and brutal. A selection of my drawings and paintings made on location during this week as well as several framed works completed on location elsewhere in Scotland will be on show at The Natural Eye exhibition at the Mall Galleries in London next month 25th October-4th November. Once again I have just spent a fabulous week drawing and painting on the Isle of May with great company and fine weather. After the long and late winter this year the seabirds were several weeks behind what I've seen in previous years when many were already on nests and eggs. And sadly there were several casualties washed up on some of the beaches. But, as is so often the way the island changed dramatically through the course of just seven days as puffins, razorbills and guillemots arrived in their thousands to clear out burrows or claim a cliff ledge. Eider ducks began prospecting further inland for nesting sites and the rasping call of a tern heralded their imminent return. An early start to the drawing day on my way from the Low Light to the South Horn. Sometimes its good to just really concentrate on the form of the birds and attempt to understand the shapes a little better. Making studies such as these puffins I spend a lot of time observing the movements, shapes and attitudes of the birds, aiming for a simplicity and fluidity of line without complicating my thoughts with colour or background. Many thanks as always to Leo du Feu for organising and Nye Hughes, Emily Ingrey-Counter, Kittie Jones, Chris Leakey, Jane Smith plus all those working or carrying out research on the island for excellent company! It has been a pleasure working with Williams Murray Hamm agency creating linocuts for the new Aberlour whisky branding. The project has involved several designs using one of my favourite combinations of a single colour print with just a dash of red to spice things up. And linocut was selected as the perfect medium in line with the attention to craft employed by Aberlour in their production of this very fine Speyside single malt. As the Aberlour founder's family motto goes; "Let the deed show". ....and out on location (The Rendezvous Gallery, from 3rd March). In June I returned to Shetland for a month as artist in residence at Sumburgh Head Lighthouse and RSPB reserve. The long days of the "simmer dim" when it never becomes completely dark, wonderful light of passing weather systems and the fantastic wildlife all provided a wealth of inspiration and a never ending source of fascination. On the breezier days fulmars glide effortlessly at the cliff edges while puffins preen at their burrow entrances. From the rocks below, the faint whiff of guano drifts up from guillemot colonies where parent birds cling to seemingly unfeasible ledges, incubating their single speckled blue egg. Not far away in a shoreside boulder field, arctic terns are joined by gulls to announce the arrival of any intruders and a few ringed plovers, oyster catchers and turnstone patrol the waterline. Looking beyond the cacophony of birdlife are the dramatic landscape forms, many sculpted even now by the ongoing effects of wind and water. And nestled among it is the evidence of human habitation, a derelict cottage, broken down wall or carefully stored set of nets and creels. But for me probably the highlight of my stay was a trip out to the base of the cliffs on the Isle of Noss with photographer Richard Shucksmith http://www.shetlandphototours.co.uk/ and Phil Harris of Shetland Seabird Tours http://www.shetlandseabirdtours.com/. Noss is a National Nature Reserve and the nesting site for over 8,000 gannets. These are birds which I've watched many times from shore since childhood as they make their characteristic dives into the sea or perched in their nesting sites. 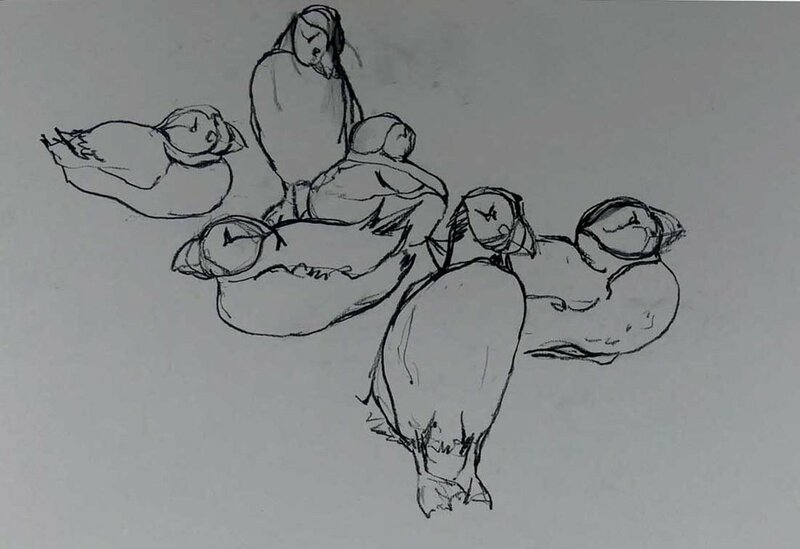 But this trip was to be something different...drawing the birds from close proximity in the boat and then slipping into a wetsuit and snorkel to spend some time in the (very cold!) water with them. It was great fun being out on the boat with Richard and Phil, getting some incredible underwater film footage and photography and absorbing all the knowledge they've gleaned over many years. Many of my drawings were rather liberally spattered by the birds overhead...a rather nice vibrant green as it turns out when dry! But the transformation in actually being able to see these birds as they dive and swim was extraordinarily beautiful, plumes of bubbles following them through the water and a shimmering play of light. The morning is clear with only a dampness underfoot as reminder of the misty night before and we are lightly buffeted by a gusting breeze from the south west. In the distance is a narrow spit of blue-grey shingle across which we slithered our way this morning from Eilean an Taighe (House island) to Garbh Eilean (Rough Island) where the beach gives way to a looming cliffscape. Standing in the midst of a craggy boulder field below these cliffs, thousands upon thousands of seabirds jostle, preen and take flight in a great swirling mass, some coming to settle and form huge floating rafts in the bay. Underfoot a puffin emerges from its burrow among the boulders. Further around the coastline immature white-tailed sea-eagles soar on the updrafts, heath spotted orchids and butterwort nestle in the grass and the ragged line of the Galtas churns the sea to a white froth. These are the Shiant Isles, lying in the Minch between Skye and Lewis, uninhabited and with the sole permanent habitable structure being a tiny two room cottage which is our bothy for the week. Huge vistas range uninterrupted from the distant blue hazed Cape Wrath in the north to the unmistakable landforms of the Quirang and Neist Point on Skye. The jutting silhouettes of Fladda Chuain and the Galtas interrupt the expanse of the Minch, then the eye sweeps onward to the Uists, Scalpay with its lighthouse and the nearer coasts of Harris and Lewis before swinging out to sea once more. Exploring the islands they slowly begin to reveal some of their many facets. Rough, wind-scoured tops conceal nests and other treasures among a sea of browns from deepest sepia to palest bleached bone. These give way to lush pasture on the lower slopes where old run-rig field systems are still etched into the landscape. Sea thrift is abundant on the cliff edges, huge balls of it from the faintest pink hue to deep coral, providing a romantic if unappreciated bed for the mating razorbills. And the birds are our constant companions, whether the shrill unbroken song of a skylark high overhead, guttural call of great skuas or dull rasping and grumbling of razorbills and puffins. To be among such volumes of bird life, some almost within arms reach and unconcerned by our human presence is a breath-taking experience. As the sky suddenly fills with a flurry of beating wings it is almost overwhelming. However, the islands have felt the impact of the introduction of a non-native species, a challenge which many islands face. The RSPB are currently in the process of a rat eradication programme, in conjunction with Scottish Natural Heritage and the Nicolson family who own the islands, aiming to help the recovery of seabird populations. The vegetation of the islands is also benefiting from the gradual decline of the grazing pressure by sheep. There is a strong hope that as the Shiants recover their natural ecological equilibrium they could go on to provide an even greater habitat, nesting sites and home to a huge variety of wildlife. On our final morning the Shiants lie heavily wreathed in mist, a last walk onto the hill behind the cottage rewards us with two tiny snipe chicks huddled among the grasses. And when the mist blows clear enough to see the mass of Garbh Eilean, its towering cliffs and one last glimpse of the thronging seabird colony as we head out to sea, I know it is a place which will remain vivid in my mind's eye. I'm delighted to have been asked to work with the fantastic Off The Rails Arthouse in Ladybank, Fife in July to run a week long summer school in printmaking. Its a beautiful space covering two floors in a light flooded building next to the station and a great atmosphere to spread out with plenty of space and get messy! I'll be hosting a workshop suitable for all levels whether a complete beginner or if, like me, you are looking to keep developing and refining your range of skills and techniques. There will be lots of time to experiment and be guided in how to incorporate printmaking into your current practice, no specialist equipment required so you can continue at home with just a few basic materials. Printmaking is a huge part of my own practice, whether as editions or unique pieces, painterly or stylised. Its a great medium to explore and opens up so many options when you get to those critical decision making points in a painting and don't know what to do next...with printmaking you can make multiple versions! Or send me an email to find out more. Last month I was fortunate enough to tread in the footsteps of John Muir, the Scottish born naturalist, writer and early advocate of wilderness preservation, who played an instrumental role in the creation of Yosemite National Park, California. Muir describes the Yosemite lanscape in vivid and exhilarating detail as one of formidable and imposing rock formations, lush valleys, high sierra and cascading waterfalls, all begging to be explored in detail. In winter the landscape is transformed to a breathtakingly monochromatic simplicity with vast slabs of granite looming darkly in shadow or glaringly reflective under the midday sun and surrounded by a powdery blanket of snow. Away from the valley floor the scale of the lanscape quickly becomes even more apparent. Consulting our map at the furthest point of a days hiking reveals that we have barely entered the vast expanse of wilderness which the park encompasses. The names themselves are evocative of place and form...Half Dome, Glacier Point, Chilnualna Falls, Clouds Rest, Hetch Hetchy.... Working with a very limited sketching kit, I stop periodically to make rapid notes and drawings. The sense of urgency to capture an impression on paper is even greater during these short winter days. An extra frisson is added when the rumble of distant and sometimes not so distant ice and rockfall shatters the tranquility. The bases of waterfalls have become vast cones of snow as the water freezes on its long descent and the rockface to either side is frosted with patterns and icicles. Arriving on the plateau at the top of the falls is a moment of clarity as the narrow gully ascent opens out to a vast expanse of unbroken snow, scattered pine forest and yet further peaks. And as always there is the compelling intrigue of the unknown, stretching out into the distance. Unfortunately not to be explored this time.... an approaching series of winter storms which raised water levels almost to flood level, caused numerous rockfalls and splintered trees like matchsticks made any real backcountry exploring inadvisable. But to be immersed over several days in such an awe-inspiring ladscape was incredible. In the words of John Muir "In every walk with nature one receives far more than he seeks". I'm returning to the Rendezvous Gallery in Aberdeen this month with a new show of works from the Shetland Isles, the Isle of May, Isle of Skye and various skerries and sea stacks of the Scottish coastline. Much of the work has been completed on location, observing not only these extraordinary landscapes but also the rich habitats and seabird life which they support. It has been a priviledge to put this body of work together and allowed me to explore some of the most dramatic and inspiring coastlines in Scotland. From the fog-shrouded first landfall of returning puffins in spring to the deafening roar of wind and waves from which I was eventually forced to retreat back to shelter on Shetland. All have presented a new facet and different insight to an environment constantly in flux. The exhibition opens on Friday 4th November 6-9pm and continues until 19th November. Drawn to Land and Sea opens at Kinblethmont House Gallery in Angus on Saturday 29th October 2016. It is a collection of works by Leo du Feu, Nye Hughes, Kittie Jones, Lara Scouller, Susan Smith and myself inspired very much by our week-long expedition to the Isle of May earlier in the year, supplemented by other drawing trips to coastlines and islands. If you would like an invite to the private viewings on Friday 28th and Saturday 29th October please contact me. Arriving into Lerwick in the early morning by ferry, Shetland is wreathed in a fine low-hanging mist which blankets the landscape, softening and enveloping its edges. Later in the day glorious summer sunshine will break through creating dazzling patterns on the sea. It is emerging from a lingering pocket of mist into such sunshine that there is the first glimpse of Sumburgh Head Lighthouse. From land which has tapered away almost to sea level the ground suddenly surges upward again to create one final jutting headland of rock, scoured meadow and cliffs, home to the Robert Stevenson designed lighthouse and nesting site to thousands of seabirds. Constructed in 1821, Sumburgh Head was the first lighthouse in Shetland and the Smiddy building which also served as accommodation quarters for occasional or visiting lighthouse keepers now became temporary studio and home for two weeks. Arriving in a new environment can be exciting but also daunting - where to start, what to draw first, how best to capture a sense of place and above all how to do it all in a finite period of time. Not to mention battling with wind, rain and a drawing board determined to take flight on those days when the weather is a dramatic sequence of shifting light and wind-blown spume but every movement is a struggle against the elements. There is however something about more demanding conditions which sharpens the senses and a rush of energy to get it down on paper before the moment passes. In this drawing made on Noss, the crest of the hill or Noop of Noss was catching a strong breeze and wisps of cloud and mist being blown up and over the cliffs. 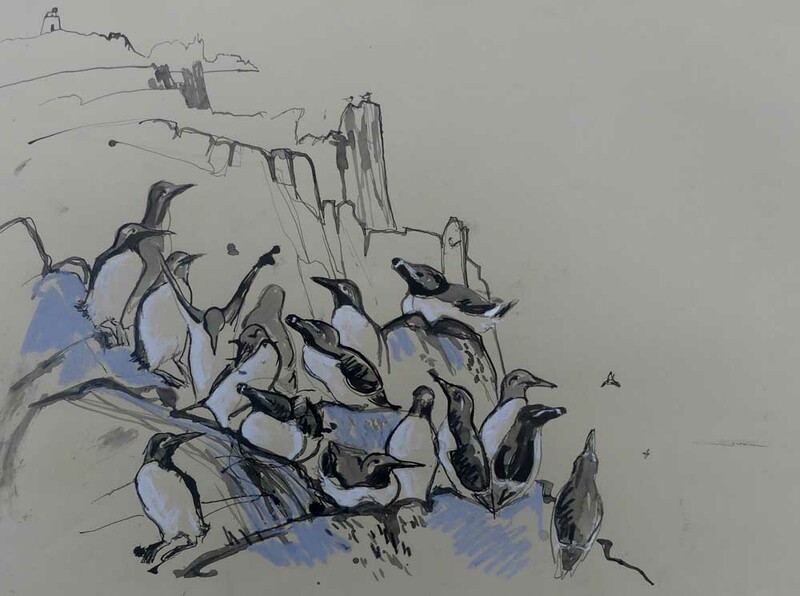 I had initially hoped to include a group of gugas (immature gannets) just the other side of the wall but after only a few strokes of the pencil their initial inquisitiveness turned to nervousness and one by one they took flight, dropping down from the edge then catching an updraft to soar along the cliff. My attention shifted to this viewpoint of the birds at eye-level and constant wheeling of their white forms above dark caves in the cliffs. The quality of shifting light was one of the most attractive aspects of Shetland, and of many islands where the expanse of sea heightens the effect of varying conditions. From stark, almost painfully bright glints on water and wet rock to the soft blending of low cloud where it becomes impossible to distinguish the horizon line. The lighthouse became a focal point in many drawings, this one made from a sheltered cleft between huge slabs of black rock. It had been windy enough to whistle constantly through the keyholes of the cottage and transform the sea to a white froth of spindrift and spume. What particularly attracted me was the contrast of slick black rock, seafoam and scattering of boulders and pebbles thrown up at my feet by previous storms. On some of the rocky outcrops just the other side of the cliff wall the shags clustered together in large groups, feathers ruffled, waiting for calm. The next day they were gone, only to be glimpsed on thier more habitual low lying perches at the sea edge. The landscape itself has many different aspects to give, on Mousa the impressive Iron Age Broch, stone walls and beaches are home to the beautiful storm petrel. Coming to land only after nightfall its call is a strange combination of whirring chirps and inspite of its diminutive size (a little bigger than a sparrow) it spends most of its life at sea. I had the rare priviledge of seeing the birds at close quarters thanks to a team who were undertaking some ringing and documentation work. The storm petrel has an unexpectedly musty scent similar to an old house which has been closed up for too long and a wonderful way of stretching the wings skyward for a moment or two before take-off almost like a gymnast or high-dive athlete poised in the moment before action. Then a swift ficker and they disappear back into the dark. Each day at Sumburgh brought a fresh perspective on the same subject. Looking out from the lighthouse over Scatness to Quendale or south to Fair Isle, watching weather systems passing through, fulmars effortlessly gliding by with the merest tremble of the wings to change direction and occasionally a glimpse of things that the landscape has concealed - both man-made and natural. I will be returning to Sumburgh in June 2017 for a month during which time I will be exhibiting work produced as a result of the residency. Some works from Shetland will also feature in my forthcoming solo exhibition at the Rendezvous Gallery, Aberdeen during Novemebr 2016. I had a fabulous couple of days last week exploring the dramatic coastline at St Abbs and sight of thousands of guillemots jostling for space on the sea cliffs. Every now and then the mist came swirling in from the North Sea and obscured all but the faintest ghost of the crags, the only indication of life being the persistent high pitched calls of the kittiwakes and background chatter of guillemots and razorbills. I was recently asked to contribute an article to the Scottish Natural Heritage magazine describing how my work is influenced by the natural world. The full article is available online and print copies are available at a number of venues such as National Nature Reserves across Scotland. (Page 60). The RSW show opens this weekend in Forfar with a wide selection of work in water-based media. I'll be showing two works both inspired by some of my travels and the result of much experimentation. I find that working across a variety of media leads naturally to approaching work in new ways as one discipline informs the other and my printmaking practice has had a strong influence on the development of these pieces. This is one of a series of "Lost Postcards" from Cuba, my postcards (those which turned up) took over six months to reach the UK leading to questions around communications and freedom of speech both within Cuba and its relationship with the wider world. Below, a painting on constructed papers reflecting the wonderful higgeldy-piggeldy effect of crumbling plaster, painted signs, posters and other ephemera which captivated me in India. I'm very pleased to be part of an exciting new collective of printmakers who all make our work in Dundee. The mutual support of everyone at the workshop, opinions, advice and general cameraderie have been invaluable over the years so now its nice to look forward to showing work together as well as making it alongside each other. Keep an eye on the website for news of exhibitions and events, hopefully coming soon! I have just spent a wonderful week on the Isle of May in the Firth of Forth, walking, watching, drawing and absorbing the rhythm of life on the island. Predictably the weather was changeable and there were moments of battling the wind as paper and drawing board threatened to blow away or having to dry out a sodden sketchbook by the stove. But it meant seeing so many different facets of the island as sea spume swirled around the cliffs at Altarstanes Harbour, the magical appearance of vast numbers of puffins from the gloom of a murky morning or shags preening and glistening in the sunshine. I had a fabulous day out drawing the Black Spout waterfalls at Pitlochry last week. The sun was shining, the birds were singing, it was actually warm enough that my hands didn't go blue working without gloves on! Here are a couple of the drawings, really enjoying the play of light on still pools or foaming, rushing torrents and some lovely rock forms. A few quick sketches from my travels around Dumfries and Galloway on a glorious frosty and sunny morning in February. And drawings in ink of some fantastic tree forms. I really enjoyed getting back to basics making these, restricting myself to working purely in black and white with one brush and a twig. Its always a pleasure spending a few hours outside, getting completely absorbed in a subject and thinking of nothing else but what the next mark will be.